March 27, 2015 This could be my reality. The day started with a shock, it seems that today is day light savings time in Gaza (who knew?) and I have already lost an hour. This doesn’t seem quite fair, but the delegates hustle into the van in a befuddled sort-of-ready for the day. Marwan Diab, our guide and organizer extraordinaire from Gaza Community Mental Health Program, is wearing a running suit (it is Friday which is actually like Sunday in the US) and we are going on a tour of the Strip with Hamada Al Bayar, a wonderfully warm, sensitive, intelligent man from OCHA (UN Office for Coordination of Humanitarian Affairs) on their day “off”. As we drive along the Mediterranean I see occasional fisherman in tiny boats with nets piled high, clusters of shacks on the beach, children draped over the metal fencing along the road competing with laundry and mattresses. 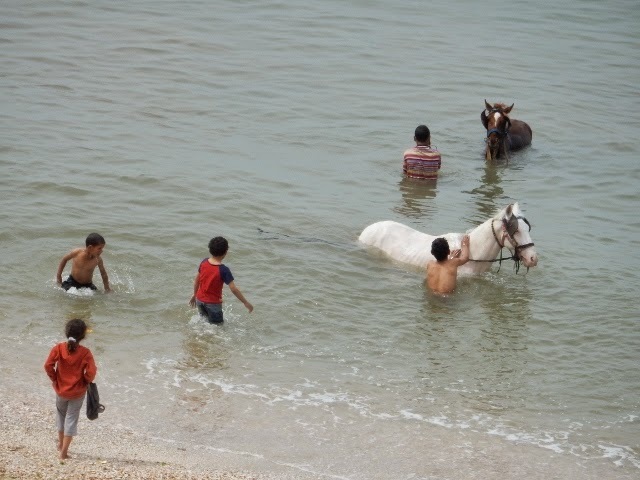 Young men play in the water with their horses, some riding them into the water, some splashing them or just having a good time. Even horses need a break around here. Across the street many buildings are splattered with bullet holes or crumpled under the impact of heavy bombing. 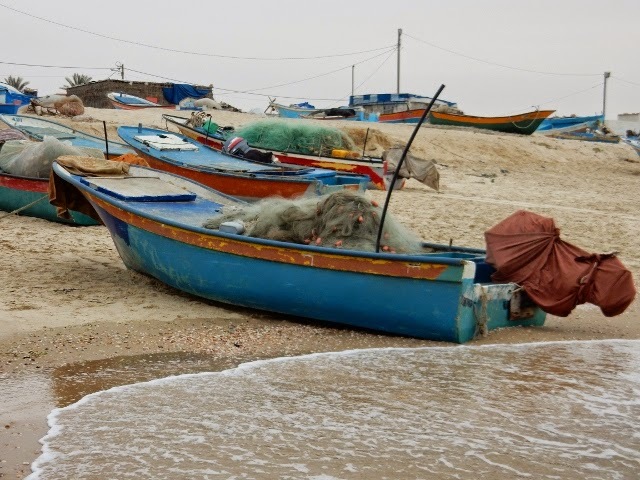 Hamada reports that at this time, 80% of Gazans are aid dependent in some way, the Israelis have succeeded in destroying the economy, industry, farming, fishing, exports, and the list goes on. If there were no UN agencies, the wellbeing of the population would be even more catastrophic with starvation, no education or health care. “We should be on a sustainable not emergency schedule.” Up ahead a mosque proudly dominates the view, two tall minarets pierce the sky. This was reportedly financed by a Gazan economist who built his fortune on the tunnel economy; some wonder if the mosque is part devotion and part money laundering. We ask what has happened to the hundreds of tunnels between Gaza and Egypt, and Gaza and Israel? In 2013, there were 5,000 truckloads of merchandise from Egypt monthly and now there are none, destroyed by Israeli military actions and Egyptian flooding, gas and bombing. The tunnels to Israel were all military and are now gone as well. While the tunnel system created a huge corruptive black market, it was also critical to the Gaza economy and for the fuel to run the now crippled power plant. 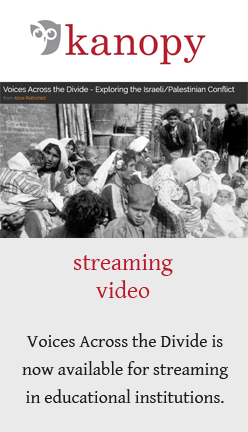 Post war, 100,000 Gazans remain homeless or in shelters or with (stressed out) host families. 30% live in their damaged homes with makeshift arrangements using plastic, wood, and cloth often in very risky arrangements. (That is quite obvious just gazing out the window of the van.) Since the war, housing needs have doubled with 130,000 homes destroyed. The Gaza Reconstruction Mechanism was brokered by the UN and has given support for families with minimal damage to their homes. Hamada reflects on the difficulties of surviving the war with an intact home versus a pile of rubble. It was all so arbitrary. The lucky ones find it difficult to have something when their neighbors do not, yet it is also not possible for the intact home owner to offer space and support to all the family and friends in need. It is a strange dynamic, a unique kind of Palestinian survivor’s guilt. He also explains why there is little to no garbage collection in these areas. Municipalities are poor and rely on fees, collection rates are down. The price of fuel to run the vehicles has gone up. Often the staff goes months without their salaries. I watch a donkey root around in a mound of garbage, children picking through trash, a little boy clambering up a pile of rubble to play and hang off the second floor of a partially crumpled building. Back to the critical topic of water, Hamada reviews the stark reality. 95% of Gaza water is not drinkable. 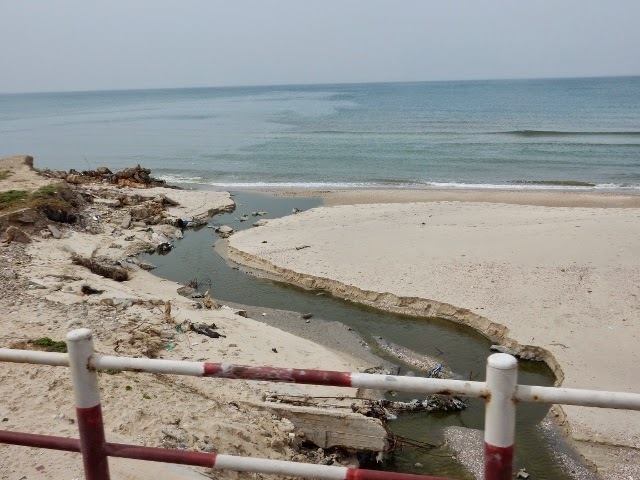 90 million liters of sewerage pours into the sea daily, not only polluting the sea (which by the way folks on your beautiful beaches in Ashkelon and Ashdod, water knows no boundaries, just a thought) but wasting vast quantities of grey water that could be used for irrigation. There are desalination plants but the water infrastructure has largely been destroyed by Israeli military action and the water filters are reportedly less than optimal, resulting in water with high levels of sodium which then combines with calcium and leaches the calcium out of the bones of young children who are now at risk for osteoporosis (along with everything else). The US has worked to remove the unexploded ordinance (with their made in the USA labels), working through a word salad of organizations: the UN, UNDP, USAID, and PA. No one gives directly to Hamas except Arab countries like Qatar since the blockade in 2007. This leads us into a conversation about Hamas which catches me by surprise. Hamada says that Hamas has made it clear in diplomatic speak that it would accept a long term hudna with Israel and recognize Israel’s existence with a return to the borders of 1967 which is the basis for all the “peace talks” that have dribbled along since 1993. This has fallen on deaf ears since Israeli leaders have no intention of returning to ’67 borders, so who is obstructing who? But more importantly, what if Hamas came out and recognized Israel (forget the right to exist as a Jewish state stuff), denounced violence (which they have done in their actions/ceasefires in the past with minimal international acknowledgement), and recognized other agreements, ie., what if they behaved like Fatah? Really folks, what has that gotten Fatah: a massive and growing settler movement, a heavily occupied and militarized West Bank, minimal access to Jerusalem. So this is actually not about Palestinian recognition of Israeli rights, but rather Israeli recognition of Palestinian rights. Think about it. We wander, sweating in the hot and muggy sunshine, through fields of string beans, potatoes, corn, strawberries; there is evidence of the war everywhere. Hamada tells a story of a family he knew who gathered all their sons and daughters who were living in Jabalia and Rafah, the “high risk areas” in the north and south of Gaza. 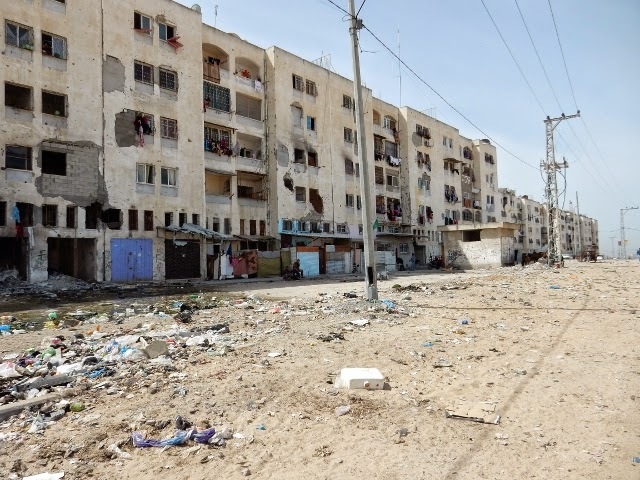 They went to live in Gaza City where it was supposedly “safer” and then almost everyone was killed in a massive bomb explosion huddled in their safety zone. We hear these kinds of stories over and over again. We continue our tour and stop by a massive apartment complex along the sea. How can I possibly describe this? The buildings are five to six stories high, partly skeletal walls and floors, partly heavily damaged apartments, vast segments collapsed at odd angles, a wheel chair is visible from one of the floors (how did that person get out?) 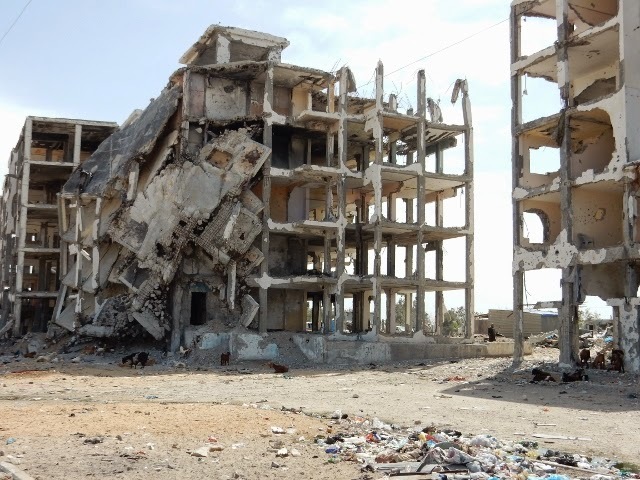 and people are living in whatever they can salvage, laundry hangs from fragmented windows, there is a cluster of shacks in the storage facilities at the base of the building, donkeys and goats wander in and out of the rubble. It is an unspeakable monument to human suffering. Four young men come to talk with us and they are smiling, warm, arms draped across each other’s shoulders, one speaks English. One has seven children and they are living in a storage area, they want us to know what happened to them and to tell the world their story. And then one of them says he has a joke: “We want to forget our pain. If we had alcohol we could forget.” This seems uproariously funny and they all crack up… apparently living through an unimaginable war and surviving in something close to hell seems more likely than a bottle of forbidden booze. Donkeys laboriously pulling carts piled high with chucks of concrete pass us over and over again. Hamada explains that it takes 10 hours to crack up enough of the larger fragments of cement walls and rubble to fill a donkey cart. The men get 15 shekels for their efforts (divide by 4 for dollars) and these are taken to a facility where the smaller chunks are crushed and used to create (poor quality) bricks, filling the air with a fine dust that penetrates your lungs and turns the bushes grey. This is called making a living and reconstruction in Gaza. There has been no research on the possibility of war toxics in the rubble, but one can only speculate. I suspect the Israelis used the same weaponry in Iraq and we have worrisome data on that. We pass the massively leveled mosque in Beit Hanoun as Hamada explains that during the war, he moved his family to his office at OCHA, “I made my office my home.” Later he reveals that every time he comes back to these areas “I feel like it’s the first time. My body reacts the same, the same stress, the same pain. It takes me four to five hours to get over it. It is really hard to be a humanitarian worker and having family and seeing this… that could be my reality, when will it be my turn? It is really hard.” He was having dinner with his younger son who questioned, “What do you think of buying a new apartment? What if another war comes and our apartment is destroyed? So we should have a new place.” What can a father say? “He is still traumatized. 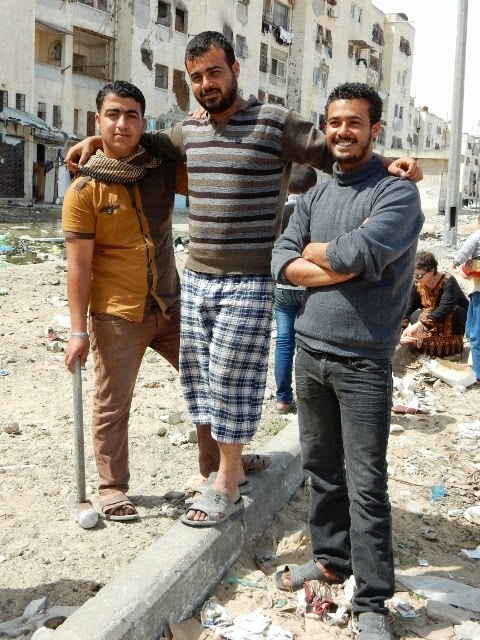 If I buy a new place it means I cannot protect him, but I am the same as him.” We drive slowly by the el-Wafa Rehabilitation Hospital. It has literally been completely leveled to the ground. I cannot help but wonder, so when is a rehab hospital, we are talking wheelchairs and crutches and damaged bodies, a legitimate military target? News flash: It is not Daylight Savings Time until tomorrow. The gift of an extra hour today. It does not take much to please me, but there is some metaphorical message here, even in Gaza life is so upside down that there is a debate as to the actual time of day. We are back in Shejaria and Banksy’s kitten, I am getting to the point that I can recognize one tragic bombed out site from another. The challenge is of course to not lose that primary sense of horror. As barefoot wide eyed children start gathering around our Martian lunar landing, we are surrounded by total havoc. Neighborhoods with no infrastructure and no services, a largely invisible crisis of epidemic proportions. In the winter the rains came and what passes for homes were flooded, there were problems with flooding, rats, stray dogs, and the smells of unwashed humanity and unprocessed sewerage. We learn there were five major foci of destruction in Shejaria during the war. This looks more like Dresden style carpet bombing to me. Hamada explains that there is no functional Hamas government. I think of the bombed out Ministry of Finance for starters, the year of no Hamas salaries, the three months of no PA salaries. It is hard to get anything done if no one is paid and there is no concrete, yes? Officially there is a government of national consensus in Ramallah but no working system here. The Hamas social movement provides substantial social services and systems, medical, educational, and humanitarian in nature and that actually is part of the shredded safety net around these parts. We drive through a busy market in Shejaria filled with the pungent smells of fried food, red-yellow-blue-green umbrellas like circus tops over rows of fruit stalls. At the barber shop, the barber is applying his straight edge razor to a customer. The souq is bursting with cheap clothes and products probably from China and there is a background cacophony of loud honking from the kamikaze drivers and motorcyclists. To head south, we change to a greyhound style bus, Abu Olba for Tours and Travel, an ironic name for a place where you really cannot go anywhere. There is a feeble air conditioner which is so appreciated; we head off to Rafah. The bus is filled with staff from GCMHP, some of their families, and us, Marwan is playing MC. We all introduce ourselves, sing songs from our respective traditions, (blues, protest, Farouz), munch on hummus sandwiches and Thai spiced nuts, relax and have a good time, which is welcome after such unrelenting sorrow. But we cannot exactly leave the reality. Driving along the coast, we pass by Wadi Gaza where the river of sewerage flows into the sea and the stench is unbearable, the crowded Nuseirat Camp on the left, into Khan Yunis. We pass through the site of the former Jewish settlement, Gush Katif, which occupied 1/3 of the Gaza water front until 2005 and see the remaining rows of orchards and palm trees. Our driver explains that during the war, 14 buses were destroyed, seven of his family members were injured and eight of their houses were destroyed during an attack on a Gazan militant that has never been confirmed as successful in hitting the target. We tour through Rafah close to the Egyptian border where over 500 tunnels were destroyed in 2014 reportedly by Israeli F16s bunker buster bombs and Egyptian gas, water, and explosions; we can see Egyptian military towers and a mosque. Rachel Corrie was crushed by a bulldozer in the area in 2003 trying to protect the Nasrallah home from demolition. As I have mentioned, prior to the closure of the tunnels, this area had a huge infrastructure, industrial areas, and a spirited tunnel trade ranging from cars and cows to weapons. A young man states: “We are not terrorists, we are ordinary people.” 126 people were killed in Rafah during the bombing of the market in 2014. I am beginning to understand the flags waving here and there: Yellow: Fatah (many more than expected), Green: Hamas, Black: Islamic Jihad or Salafist (rare). We stop by an area in eastern Khan Yunis with a local crisis team and like the day I toured the area with PMRS, are confronted with just extraordinary destruction, poverty, and despair, rows of caravan houses, an older woman gesturing: “We do not want food or houses, we want our rights!” and another very wrinkled elderly women following us to the bus, begging and begging, clearly beyond desperate. We are all shaken from this confrontation and emotionally weary. As we have nothing to offer, this is feeling like occupation tourism and a number of us are very uncomfortable. The challenge of course is not to glaze over and to learn to sit with that immense discomfort and then do something about it. Our final stop is the beach, a lovely area next to a beach restaurant type place, clusters of plastic chairs and tables on the sand, families enjoying their Friday off, soccer games, laughter. There is something so calming about the smooth sand between my toes and walking along the water, (I can almost feel the e coli migrating up to my knees) as I try to keep my long skirt from getting soaked (it did) without breaking the modesty expected of me. Only young men are swimming. 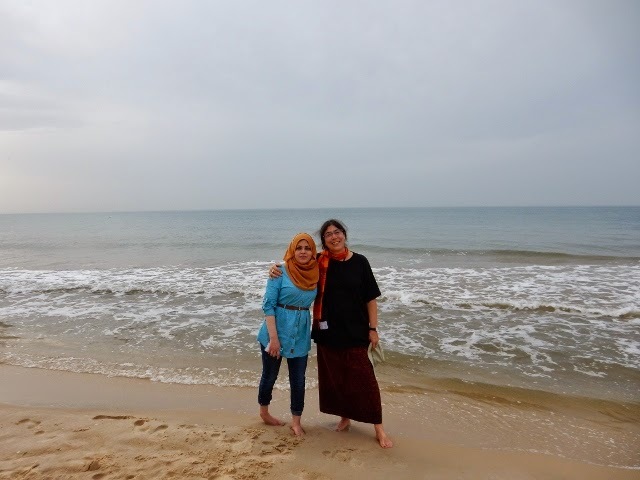 I talk to a young Gazan woman who says she comes to swim at 5 am because she does not like to swim with her hijab on. I walk back and forth, enjoy some actual physical movement, climb up some concrete blocks to check out a small port area, rows of small blue, yellow, and red motor boats, nets piled high or drying in the sun. 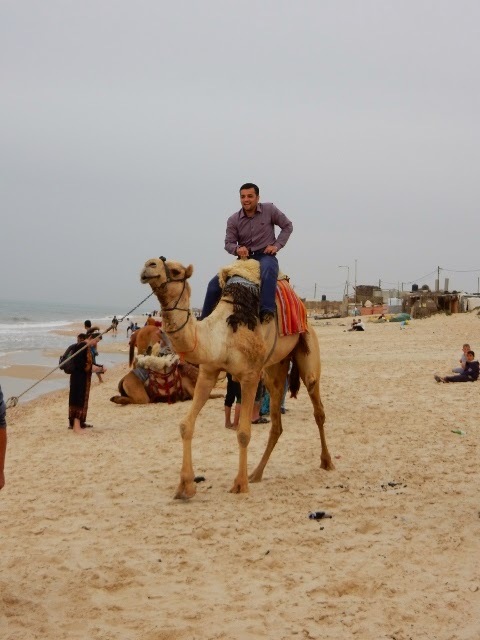 There are a couple of supercilious camels on the beach, available for photos and rides. I love how they fold their legs under their bodies, totally awkward and graceful at the same time. The male species here is unclear how to relate to a cluster of uncovered western women mingling with really gorgeous Palestinians who have mastered that subtle technique of looking extremely modest and extremely alluring all at once. They do take off their heels to walk in the sand, subhanallah. But soon they are too uncomfortable with all the stares and camel ride offers and it is really time to go home.